We are looking at the likelihood of invasion of organisms associated with the live baitworm trade from its source in Maine to its distribution in the United States. We are working with the industry to develop effective packing material treatments to reduce hitchhikers and exploring options to reduce bait-related introductions. While major introduction vectors*, like commercial shipping, transport extraordinary volumes of many marine species around the globe, less conspicuous vectors, like the live saltwater trade (e.g., bait, seafood, pets), are also significant movers of species, resulting in major introductions such as the European Green Crab, one of the most notorious invaders worldwide. Though the overall volume of organisms transported is comparatively lower in live trade, these vectors may be more efficient means of introducing new species because they are less environmentally stressful for the organisms in transport, and often introduce reproductively active adults. 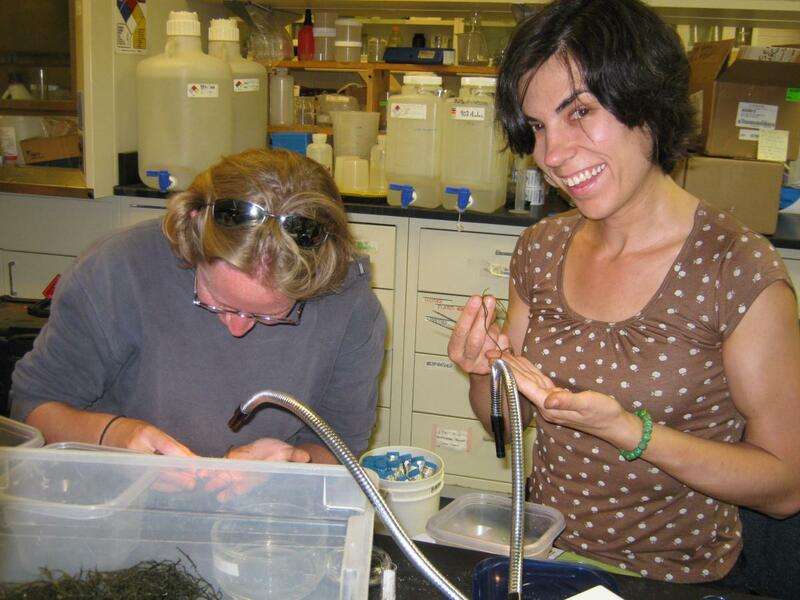 Our lab has been closely investigating the live saltwater baitworm industry in North America. Polychaete baitworms and marine algae ("wormweed") are harvested from coastal mudflats and sold to bait dealers in Maine, where they are shipped via overnight mail to locations around the USA and abroad to Europe and Asia. Wormweed is used as packing material to keep worms protected during transport and often serves as habitat for numerous marine species. After bait is sold, the packing algae and baitworms may be discarded in coastal environments, providing opportunities for invasion. To track this vector, we have focused on biological characterization (taxonomic, functional, and genetic diversities) from field to bait shop, using the mid-Atlantic as a model recipient region. We have discovered over 100 associated taxa* in packing algae, and though this diversity drops significantly in recipient bait shops, a considerable number of live organisms still survive the journey. As such, we have been exploring ways to treat the algae to eliminate the majority of live diversity in bait-boxes. We found that a simple tap-water soak was an effective osmotic shock that killed most associated organisms, representing a cost-effective way to reduce invasion risk. Finally, with our colleagues at Maryland SeaGrant and UMD, we have been exploring social science and management implications related to this live trade vector. Miller, A. Whitman, Chang, Andrew L., Cosentino-Manning, N. and Ruiz, Gregory M. 2004. New record and eradication of the northern Atlantic alga Ascophyllum nodosum (Phaeophyceae) from San Francisco Bay, California, USA. Journal of Phycology, 40: 1028-1031. Taxon (plural Taxa) A taxonomic category or group, such as a phylum, order, family, genus, or species.